One of the biggest (and last) times of the year is upon us – New Year’s Eve! Along with friends, family, and plenty of cheer, there are also some other fun and funky items that you should surround yourself with for the special night. We’ve rounded-up 50 of the most dazzling and delightful DIY New Year’s Eve decoration ideas to help you celebrate in style. From garlands and cocktail stirrers, to party hats, photo props, and edible delights – trust us, you’re going to love what’s on offer! The best part? They’re all really easy, affordable, and fun to create. So what are you waiting for? Cheers to the New Year! Be sure to celebrate in style by making this DIY sequin banner from A Beautiful Mess. These printable New Year’s Eve cards are great for bringing to the party – everyone will love sharing their answers and reflecting on the year that was! Check out the full tutorial from Alice and Lois for your free download. Create this DIY Goals board from A Little Craft in Your Day to keep track of what you want to achieve in 2017. It’s super simple to make too! Almost Makes Perfect has created these incredibly festive and gorgeous DIY gold fringe party hats. These should be compulsory attire on New Year’s Eve! A Pair and a Spare has created this DIY decoration inspired by Chinese New Year. Isn’t it beautiful? It’s so fun to create too. Vicky Barone has created this DIY New Year’s Eve banner and she’s going to share the entire process with you over on her blog! This would look great in your living room as you count down to midnight. Boxwood Avenue has created this cute mini party hat especially for this big night. We love the addition of gold tinsel! Brit + Co will show you how to make not one, but three DIY pipe cleaner crowns to wear at your New Year’s Eve festivities! We can’t pick a favorite, so will have to make each design. Here’s a New Year’s Eve inspired craft that the children will love! Buggy and Buddy will show you how to make two different countdown clocks using simple craft materials. Wonderful! Want to make a New Year’s Eve noisemaker for the big event? This is a kid-friendly craft from Crafts by Amanda that you won’t want to miss! It’s just not New Year’s eve without a confetti popper, is it? Thankfully, you can easily make your own by following this tutorial from Danya Banya. Opting for a Parisian party theme this New Year’s Eve? Décor to Adore created these Parisian inspired party hats just for the occasion! Here’s some great party décor to jazz-up your New Year’s Eve party! DIY Network will show you how you can recreate this colorful, confetti-filled balloon. Speaking of confetti, here’s an awesome confetti popper project from Erin Spain. These are sure to turn anyone into the life of the party! You can also hand out these DIY confetti-filled sachets to each of your guests, just as Evermine has done! We love the pastel color scheme of this project. Give your glasses a NYE makeover by following these steps from Evite’s blog. Gold glitter adds a much-needed touch of sparkle! These dipped fortune cookies don’t only look tasty – they also look stunning too! Happiness is Handmade has truly won our hearts over with this DIY idea. Here’s another awesome DIY project from Happiness is Homemade, this time featuring a printable, color-in party hat. Isn’t that clever? Homey Oh My has made these stylish and glamorous DIY party hats with New Year’s Eve in mind. We love the sequin-adorned ball topper – Divine! It just isn’t a New Year’s Eve celebration without champagne and what better way to highlight the champagne table than with a balloon backdrop inspired by the very beverage? Honey and Fitz is the clever blogger behind this project. Here’s another craft idea that the kiddies are sure to love! In the Playroom has created these DIY firework inspired artworks. They’re easy and fun to make! Fancy creating some DIY photo props to jazz-up your party? I Spy DIY has been generous enough to share these ones with you – Yay! Here’s another DIY confetti popper, this time from the stylish Lauren Conrad. These are almost too pretty to use! How incredible are these DIY New Year’s Eve decorations? They look like disco balls but with a glamorous twist! Don’t miss the full tutorial from Lia Griffith. Speaking of Lia Griffith, here’s some DIY paper party hats from the talented crafter! You can make these for you and your friends this festive season. Little Bins for Little Hands has created this DIY sparkly slime, inspired by New Year’s Eve! This is a fun activity to entertain the little ones while you sit back with a glass of champagne. Here’s another DIY confetti popper, this time from Little Bins for Little Hands! It’s a paired-back and easy version of the popular party addition. Moms and Munchkins has also created these glam party poppers to bring a ‘bang’ to the party! Fireworks and confetti – does it get any better than that? Here’s something fun you can create using old wine bottles! No Biggie sprayed hers in gold and added festive numbers – we adore this. Here’s some swizzle sticks to stir your cocktails with on New Year’s Eve! These stylish DIY versions can be found at Oh Happy Day. 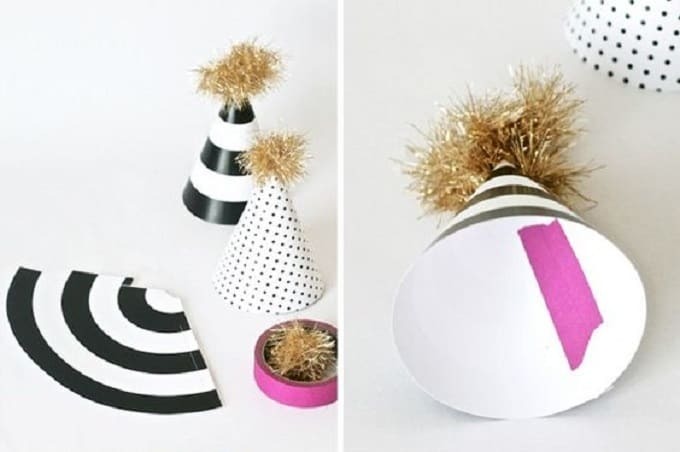 How cool are these DIY New Year’s Eve party hats from Paging Supermom? We love the monochromatic color scheme too! Bring some popcorn to the party…in style! Paper and Stitch created these color-blocked bags to keep the treat in. Have you ever thought about incorporating a parasol into your party décor? Paper and Stitch created this pretty version saying “Happy New Year”. Here are some more swizzle sticks for your party cocktails, this time featuring stylish tassels. We’ve fallen head-over-heels in love with this DIY project from Paper and Stitch! Decorate your walls with these glittery DIY garlands from Paper and Stitch. Your party guests are sure to love these sparkly adornments! These colorful party poppers from Persia Lou via Make and Takes will add that much-needed fun to any NYE party. We love how easy they are to create too! Create this ‘midnight kisses’ bag for your guests or a hostess this New Year’s Eve. Pink Peppermint Design is the genius behind this idea! Real House Moms has created this DIY New Year’s Eve inspired wreath for this special holiday. How cool is this? Wow, we love these DIY geometric piñatas from Row House Nest! These are really on-trend at the moment, so we can’t wait to create our own. Every New Year’s Eve party needs a disco ball piñata! Thankfully, Studio DIY has created her own and provided an awesome tutorial to go with it. Tick, tick – it’s 12 o’clock! Studio DIY will be celebrating NYE in style with these DIY balloons. Check out the tutorial to create your own! Sugar and Cloth has created a whole host of DIY cocktail stirrers, including this fancy and crafty version – Ooh la la! Speaking of cocktails and Sugar and Cloth, the talented blogger has also made these fancy, gold cocktail stirrers. This is one DIY you certainly can’t miss! Here’s some more NYE inspired head attire, this time from the clever Darice Craft Blog. You can make these using any colors that your heart desires! We adore this beautiful star-adorned crown from The House That Lars Built! It makes for the perfect New Years Eve inspired adornment every year. 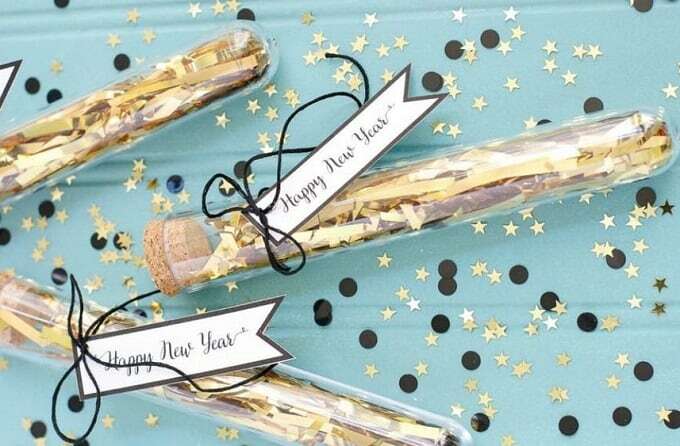 Here’s a brilliant NYE party favor idea found via The Crafting Chicks. You can get these free printable tags and add them to little tubes of gold confetti! Want to add a fun twist to your midnight celebration? The Daily Meal will show you how to create a balloon release so that you can shower your guests in the colorful decorations once the clock strikes! The Decorated Cookie has made these scrumptious looking marshmallows to celebrate the eve of a new year. They’re colorful with a countdown marked on them – how clever! Children will love trying to stay up as late as possible on New Year’s Eve just so they can move the clock hands upon every hour. This cute and crafty creation is from The Suburban Mom! How about writing your New Year’s resolution on your party hat to bring 2017 in with the best intentions? We love the quirky and fun patterns, colors and adornments on these DIY hats from Walk in Love – especially those pom poms! 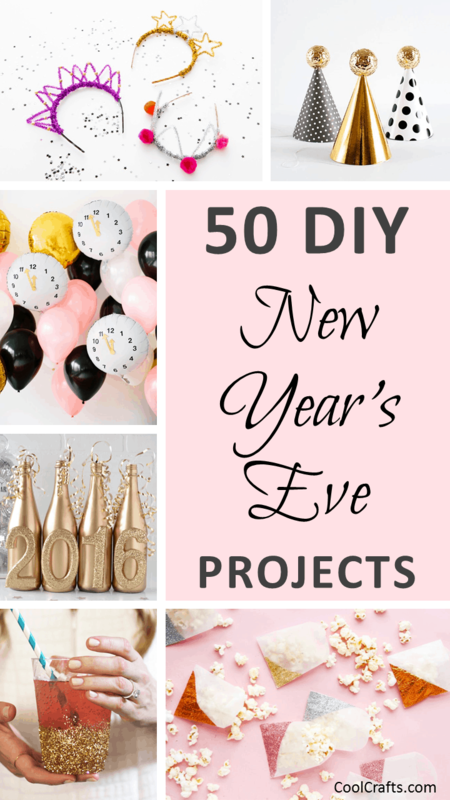 There you have it – 50 DIY New Year’s Eve projects to add some extra dazzle to the big event! Which projects were your favorites? We’d love to hear from you in the comments section below!